If your Samsung refrigerator doesn’t work properly, don’t hurry to call the service center or a master – the troubleshooting guides below will help you to fix everything up. 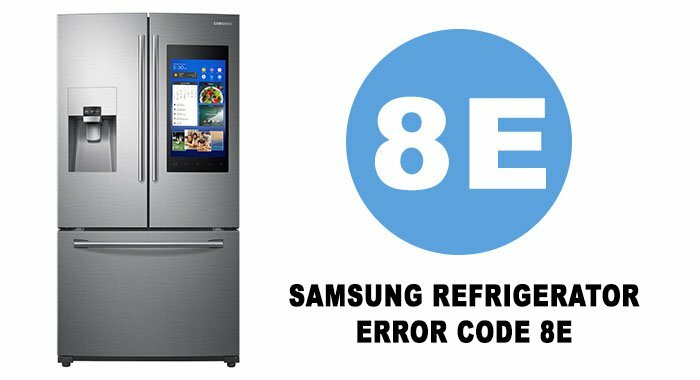 Below, you can see Samsung refrigerator display codes for different common Samsung refrigerator models. Skip through the fault codes and find the corresponding one: you will find out what might have caused the problem, and how to solve it. This error code suggests failure of the freezer defrost sensor. In many cases, replacement is the only solution. However, it may also occur due to loose wiring. Check it and fix it, if necessary. If that is the case, the error can be cleared. This error suggests a defrost sensor failure and/or power outage. First, try to clear it by resetting your refrigerator several times. If it does not work, check the defrost sensor and, if necessary, replace it. Error code 5 signals an ice maker issue. Check the device itself and its wire harnesses. If necessary, disassemble the device and check each part separately. If you see no positive result after reassembling and reinstalling it, replace the device. This is Ambient Sensor error, which may occur after a power outage. To clear it, press Power Freeze and Power Cool (or two top left and right side buttons, if the panel on your fridge is different) simultaneously and hold them for about 15-20 seconds. Usually, this simple resetting brings a fridge back to normal functioning. This error occurs due to an ice maker sensor failure. Usually, it means that the sensor is disconnected or not functional. Check the wiring and the sensor itself. You may need to replace the whole thing or part of it. Contact Samsung, discuss the problem and follow their advice. First, this can be a condenser fan error signaling a problem in the fan’s work. Please, check it and make sure it is powered properly and is operational. Also, check condenser fan to be sure it is getting power and working properly. If it is not, repair or replace the fan. Second, this may be a control board or wiring harness issue (if it is, the previous action will not work). Check the board and wire harnesses using a multimeter. It is not unlikely that the control board has to be replaced. This is a defrost error. To fix it, check the defrost timer and/or control board and take action if a problem is detected. This error does exist, and it arises from improper functioning of the water fill tube heater. In most cases, this happens when a refrigerator is moved around. Therefore, if your fridge has been through a ride or changed position in your kitchen, check the water fill tube. The wire wound around the tube is the water fill tube heater. Now you can start clearing the error. To do so, press the Lighting and Energy Saver buttons simultaneously and hold them for about 8-10 seconds. Thus you will reset your display. Also, the error may occur due to physical impact resulting in dents and damaged insulation. In this case, a professional help is required. Whether it can be fixed or part of your fridge (or the entire fridge) needs to be replaced depends on the extent of damage. If you have dented your fridge, please, do not use the heat-and-freeze way of fixing it! This will result in the foam insulation melting, which can constitute irreparable damage for a freezer, to say nothing of the ruined appearance. This is an ice maker sensor error, and there are three things you can expect. First, the problem may be in and/or around the ice maker itself. Please, check all connections around the ice maker (wire harnesses, water line, etc.) The error may signify failure of the ice maker itself. It will not tell you what exactly has failed in it, and you may need to take it apart and check every little part of it. Once you detect the problem, contact Samsung and discuss the issue with them. They may provide a new part even if it is not under warranty. Second, this may be related to lack of water in the ice maker. Check the water line and its elements that are adjacent to the ice maker. If it does not work, the ice maker may need to be replaced. This is an ice room fan error, which denoted that the fan is not running due to a disconnection. It is recommended to check the wiring and the main circuit board. This error signals a rotor lock. If there is 84E on the display, it is a very bad sign: the entire DC three speed compressor may need to be replaced. The only way to get to the locked-up rotor is to get into the compressor. Because it is a sealed and actually least accessible part of a Samsung fridge, it takes professional experience to do that. Only a licensed person can recover the refrigerant (Freon). The error code appears on the digital display due to a voltage shift resulting from the rotor lockup. When this happens, an inverter control board activates the error code (the inverter control board flashing is just another indication of the problem). Some users say that it is possible to clear the error by replacing the inverter control board itself. Over the past decade, many home appliances have shown lower reliability and become less durable. This group or errors may arise from power outage (83e) and resulting current instability at the PDA Inverter. All these errors can be cleared by resetting the entire unit. Unplug it, wait for about 1 minute and plug it back in. 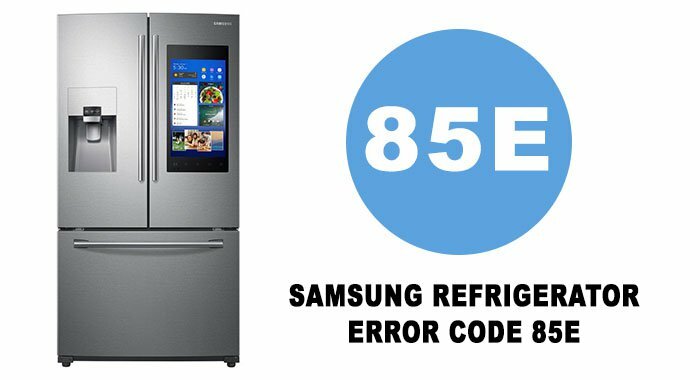 If you see 88 88, 83E, 85E, or 86E on your Samsung fridge’s display, do the following: turn it off or unplug it and wait 3 to 5 minutes. Then turn it on or plug it back in to reset the system and clear the codes. These codes may occur due to improper functioning of the PBA inverter. Samsung was founded in the 1969. Samsung Electronics Corporation has 21 production subsidiaries now. 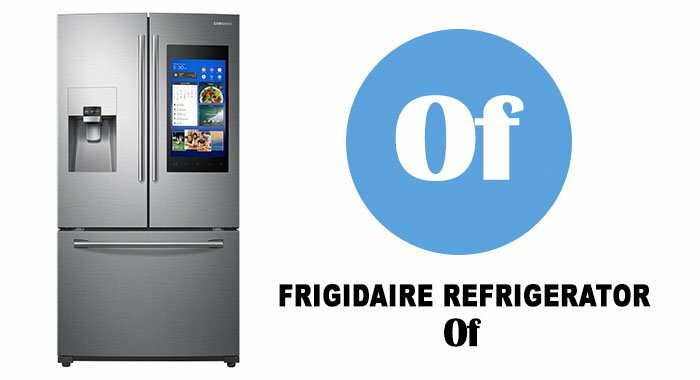 Refrigerators of the brand Samsung are known throughout the world for their practicality and reliability. The range of refrigerators of this brand is quite wide. Each new household refrigerator Samsung is modernized and improved. This applies to technical parameters, ergonomics and design. Below is a table of Samsung refrigerator error codes. Press the POWER FREEZE and the FREEZER buttons simultaneously and hold them for 3-5 seconds. Wait until the unit switches to the right mode. The “2e” fault code indicates a misconnection or a short circuit in the fresh food sensor. This requires a look into the main control board: test voltage between CN40 #8 and CN40 #9 (it should read about 4.5 VDC). The code appears right after a self-diagnostic, which is performed automatically rwhen a refrigerator is powered up first. In case it detects a problem in the sensor? The respective LED will start blinking. To clear the error, press Lighting and Energy Saver at the same time and hold the buttons for about 8-10 seconds. This fault code appears due to lack of power. In this mode, the display stops working, and the unit will stop dispensing ice and water. What to do to clear the 1E error? Press the Energy Saver and Lighting buttons simultaneously and hold them for about 10-15 seconds. After that, the unit will be rebooted and start working in the regular operational mode with the dispensing of the ice and water resumed. Clearing errors on Samsung refrigerators. Press POWER FREEZER and POWER COOL simultaneously and hold them for 3-5 seconds. The system will be rebooted, and the refrigerator will get back to normal functioning. R-SENSOR Refrigerator Room Sensor Error- open or short-circuit, connector failure. Cause is also a temperature reading > 122°or < -58 ° F.
R-FAN ERROR This error indicates the Refrigerator Evap Fan is not spinning at the correct RPM or the fan feedback line is open. 1/M FUNCTION ERROR(R on Twin 1/M) This error indicates the Ice tray has not returned to level after an ice harrest. The error is displayed after three failed attempts. PANTRY-SENSOR ERROR CR Room Sensor Error- This can be an open or short-circuit, contact failure. Cause is also a temperature reading > 122°or < -58 0 F.
F-FAN ERROR This error indicates the Freezer Evap. Fan is not spinning at the correct RPM or the fan feedback line is open. C-FAN ERROR This error indicates the Condenser Fan is not spinning at the correct RPM or the fan feedback line is open. R-1-e Ice Maker Error Display error: ice making kit is harvested more than 3 times and level error ** Apply to the applicable Ice Maker model. R-1-g R-DEF. Error Display error: separation of fresh food compartment defrost heater housing part, contact emor, disconnection, short circuit or temperature fuse error. Display error: the defrosting does not finish though fresh food compartment defrost is heating continuously for more than 80 minutes. F-1-g F-DEF. Error Display error: separation of freezer compartment defrost heater housing part, contact error, disconnection, short circuit or temperature fuse error. Display error: the defrosting does not finish though fresh food compartment compartment defrost is heating continuously for more than 70 minutes. 5 on Refrigerator Display Refrigerator temperature sensor error Unplug the refrigerator and check the wiring connections in the refrigerator temperature sensor circuit. If the wiring connections are okay, replace the refrigerator temperature sensor. If the problem persists, replace the electronic control board. d on Refrigerator Display Refrigerator defrost sensor error Unplug the refrigerator and check the wiring connections in the refrigerator defrost sensor circuit. If the wiring connections are okay, replace the refrigerator defrost sensor. If the problem persists, replace the electronic control board. E5 on Freezer Display Ambient temperature sensor error Unplug the refrigerator and check the wiring connections in the ambient temperature sensor circuit. If the wiring connections are okay, replace the ambient temperature sensor. If the problem persists, replace the electronic control board. F5 on Freezer Display Freezer temperature sensor error Unplug the refrigerator and check the wiring connections in the freezer temperature sensor circuit. If the wiring connections are okay, replace the freezer temperature sensor. If the problem persists, replace the electronic control board. d5 on Freezer Display Freezer defrost sensor error Unplug the refrigerator and check the wiring connections in the freezer defrost sensor circuit. If the wiring connections are okay, replace the freezer defrost sensor. If the problem persists, replace the electronic control board.